Thelma “Sally” Luttrull, age 94 of Sparta, Missouri passed away Thursday, July, 12, 2018 in her home. Sally, as she was fondly known to her friends and family, was born in Chadwick on October 7, 1923 the daughter of Willie and Bertha (Roberts) Coffer. On February 15, 1941, Sally was united in marriage to Donald Luttrull and this union was blessed with four boys. 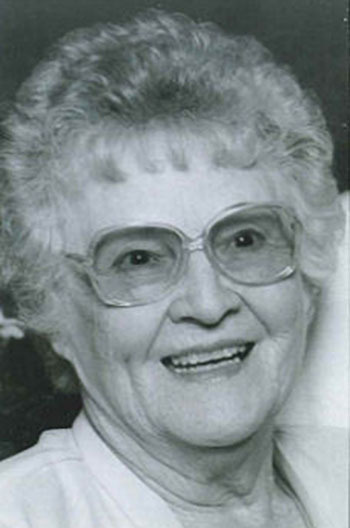 Sally was baptized in 1950, at the young age of 27, and remained a faithful member of Shady Grove Baptist Church. She was also a longtime Christian County resident and worked for Fasco Industries for over 20 years. Her life was surrounded by family but she remained fiercely independent and lived alone since the death of her husband. Sally will be sadly missed but will be remembered for her unconditional love for others and her sweet sense of humor. Sally is survived by three sons, Keith Luttrull and wife LaQueta, Denny Luttrull and wife Wanda, Gary Luttrull and wife Susan; eight grandchildren, 23 great-grandchildren and several other caring relatives. She was preceded in death by her parents, husband Donald, son Terry, two great-grandsons and a sister Goldie Nokes. Sally’s family wishes to express their thankfulness to LaShara, Judy, Daphna, Angela and Amy with Haven Hospice for being special care givers. Funeral services will be 11:00 A.M. Monday, July 16, 2018 in Barnes Family Funeral Home, Ozark. Visitation will be held one hour prior to the funeral service and will begin at 10:00A.M. Burial will follow in Sparta Cemetery and Sally will be laid to rest beside her husband. Donations are suggested to Shady Grove Baptist Church. Online condolences may be shared at www.barnesfamilyfunerals.com. Funeral services will be 11:00 A.M. Monday, July 16, 2018 in Barnes Family Funeral Home, Ozark. Visitation will be held one hour prior to the funeral service and will begin at 10:00A.M. Burial will follow in Sparta Cemetery and Sally will be laid to rest beside her husband. Donations are suggested to Shady Grove Baptist Church.